Mama, what is the best way to pre-treat a stain? Is there any one best way? Or do you just spray on the stain remover and let it be? So it might seem like a no-brainer to pre-treat a stain before washing, but there really is a best way to do pre-treat stains. 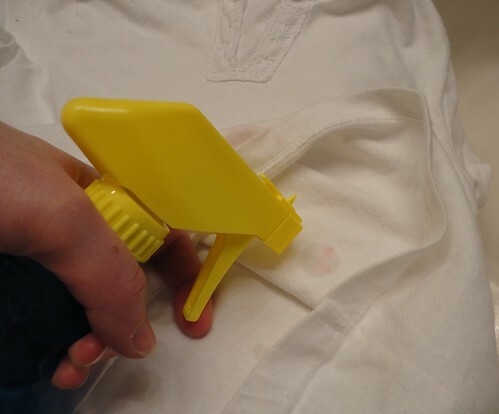 The end result of any attempt at stain removal is to have a stain-free garment. Making sure you start the stain removal process on the right foot ensures you end up with an article of clothing that looks new again. So here is a step-by-step guide to follow. Because Mama loves a step-by-step guide to most anything. First, determine what type of stain you’re dealing with: protein, food grease, ink, grass/dirt. protein-based (blood, spit-up, baby poop) – rinse under cold running water as quickly as possible. Keep it in cold water until you can launder it. If you choose to use a spray stain remover, follow the directions later in this post. food grease (bacon grease, french fries, cooking oil) – you’ll need to use the Blue Dawn method. Skip the spray stain remover step below completely. Spray stain removers aren’t really formulated for this type of stain. ink (from an ink pen or marker) – go straight to the pre-treat steps listed below in this post. grass/dirt – you’ll probably have to end up doing The Soak, but you can certainly try to pre-treat with a spray stain remover first and hope for great results! Assuming you have completed all of these crucial steps in stain removal, you’re now ready to spray on your favorite product. Spray directly on the stain, saturating the entire area. 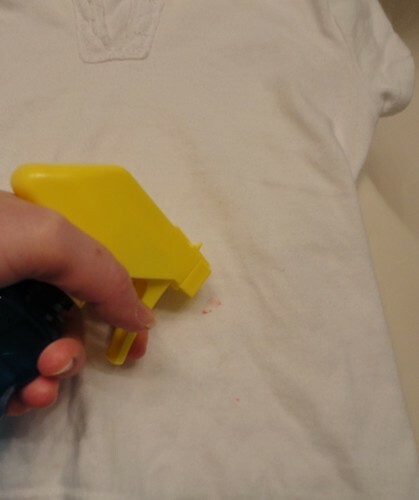 Using your finger, rub the stain remover in really well. 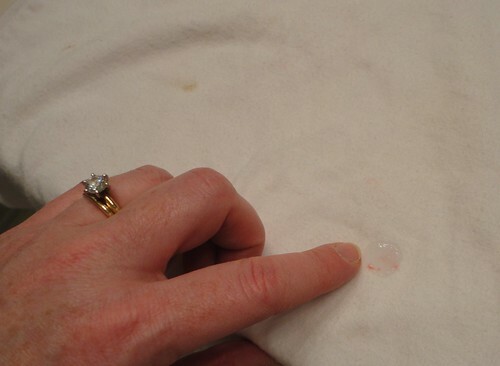 Slightly lift up the fabric with your finger, ensuring you completely surround the stain with your spray product. Next, you have the option of gently (and I mean really gently) rubbing the stain remover in with a toothbrush. If you have a really tough stain (tomato sauce, mustard, chili), you might need the extra agitation. 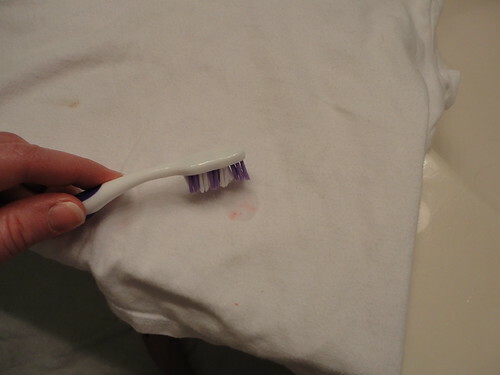 But make sure you understand: be cautious when you use a toothbrush as this can sometimes be too vigorous for the fabric and lift the color. I speak from experience. So this next part seals the stain removal deal: make sure to treat the stain on the reverse side of the fabric. Use your finger to rub the stain remover into the fabric to ensure it’s covered well on both the front side and the reverse side. Never ever rub the fabric together when pre-treating a stain. It is one of the worst techniques to use in all of laundry in my opinion. If you spray the stain with stain remover and then rub the fabric back on itself to saturate the stain with product, you can spread the stain and even make it bigger. This is not the result you’re going after. Just out of curiosity, what is your favorite product to pre-treat stains? Do you have one that you consider to be the best? « Results of the Towel Survey! I love BioKleen Bac-out spray for protein-based and grass and dirt stains. Really great for stains that will sit before being washed. It gets mustard out every time. You know, I’ve never tried anything from BioKleen. I might have to give it a go. I’m not even sure where to buy it. Any suggestions? did you tried shaklee and rocking green items yet? Really?? I had no idea you could get BioKleen from the drugstore. I’ll have to look for it next time I go. And I haven’t ever tried Shaklee or Rockin Green. Have they worked well for you? I’d love to try Rockin’ Green for my dipes! i have tried shaklee liquid detergent , which acts also as stain remover and there oxi powder and i am in love with the oxi powder, i think , it tops all i have tried before ( oxi clean, biokleen, ecosore usa ). I have seen it at Kroger and on Amazon. Oh no. 🙁 Did you find the blood removal post? If you have a steam washer, it will do the trick. In fact, I washed some pants that had blood on them this past weekend with the Steam Feature. I didn’t pre-treat or anything and it removed the blood completely. Hope you could get it out! i use woolite oxiclean carpet cleaner spray. It seems to do the job if I need something extra. It really works well on clothes stained with breastfed baby poop. I usually rinse the load of laundry containing carpet cleaner an extra time to be sure it us rinsed well from my clothes. I love fels naptha its a bar of soap and I use it to pretreat grass stains on my husbands baseball pants I can’t use bleach cause there are color strips down the sides! This was the first product out of many that totally removed the stain in the pretreating stage and its very cheap ! I’ve enjoyed reading through your blog! My question is how do you get that lovely B.O. smells out of the underarm of the shirt once they’ve been dried and seem set in. Phew! Desperately hoping you can help. Any pretreatment stain removers that can be saturated and then dropped in the laundry hamper until laundry is done? I’ve been using resolve which is great but recently had my baby’s favourite onesie weaken and rip because I left it to sit too long. I prefer to treat asap and leave till laundry actually needs to be done but I feel I may not find a product that will meet my needs. 🙁 any suggestions?